Ethel Caffie-Austin with Delnora RobertsEthel Caffie-Austin was born on the 11th February 1949 in Bluefield, West Virginia and grew up close to Montgomery. Her father was the Pastor of the local Pentecostal Church of God in Christ and she was immersed in church music before she could walk. At the age of three she began singing with the choir and three years later took up playing the piano. When she was ten she started conducting the choir and at fourteen she assembled the first Pentecostal Church of God in Christ �Mass Choir� of West Virginia with singers from ten parishes. Since then this has grown into the �Mass Choir� of West Virginia State and she herself has been appointed the Minister of Music for the State of West Virginia. It was after the death of Mahalia Jackson that she became known as the �First Lady of Gospel Music� and has since traveled extensively with both her choir and her group. The latter is made up of members of the choir and fluctuates from a duo to a sextet depending upon the venue. She regularly appears at gospel, jazz and folk festivals throughout the States, Canada and Europe but is particularly fond of appearing at the prestigious Augusta, Atlanta �Black Cultural Heritage Festival� where she has become a fixture. She has recorded three CD�s, two for her own Kobie Label; �From Generation to Generation� and �Christ is Back� and one for the Swiss Blueshouse imprint. The latter was used to promote a Swiss Blues/Gospel festival and is as rare as hen�s teeth. She also recorded a couple of tracks for Smithsonian/Folkways, which were released on a gospel compilation and featured on the Paul Jones� show last year. Two TV documentaries have been made about her work and in 1995 she became a member of the Commission of Arts and Humanities. 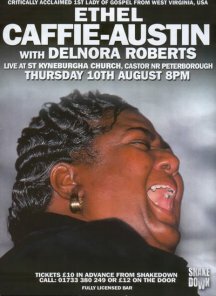 As if this were not enough this energetic lady also teaches gospel singing and piano.